“Eternity Falls” by Kevin Outerbridge – Faith, Extremism, and Cyberpunk | J.W. Wartick -"Always Have a Reason"
Eternity Falls is a cyberpunk thriller with much reflection on the concepts of faith and redemption. It centers around a mystery: the Miracle Treatment, which is supposed to prevent natural death for all eternity, seems to have failed. It’s up to Rick Macey and Sheila Dunn to find out why. I have reviewed the book on my “other interests” site. Here, we’ll look at some worldview questions it brings up. There will be SPOILERS in what follows. One of the primary themes running throughout Eternity Falls is that of redemption. Rick Macey was once a Christian, but like many people in the future (and present), he starts off the book thinking that religion has been proven to be irrational–an ancient belief with little to recommend it in the present. However, he also realizes his own imperfections and regrets. When he is confronted by Virgil, a man with whom he had strong disagreements in the past, he is also brought face-to-face with faith that is still genuine. However, it is not left at this. Virgil’s beliefs have become a bit unhinged (see below), and in a beautiful twist of storytelling, it is Macey who is brought back to faith and confronts Virgil’s own self-righteousness. Outerbridge’s tale here demonstrates something that we should all take to heart–God can and will use anyone to wake us up to our own failures and call us home. Perhaps the most poignant aspect of Eternity Falls are the conversations between Macey and Virgil about religious extremism. They both have backgrounds in combating terrorism, but their past experience led them in opposite directions and Virgil has come to conclude that facing death is the only way for humans to possibly turn to God. Virgil seeks to destroy the “Miracle Treatment” and thus make it so that everyone will once again die natural deaths, confronted with that moment when “eternity falls.” Macey, however, points out that God has used the extended lives of many of these people to bring them to the faith through their own realization of the pointlessness of an endless life of leisure. Their conversations play out in this way through the book, and Macey ultimately makes a compelling case that God may, in sovereignty, use even things which may be apparently sinful to bring about great good. The melding of the concepts of human free will and God’s omnipotent control over events is powerful, and in what is truly a reflection of Outerbridge’s talent, it meshes very well into the plot of the book. Moreover, the book portrays the impetus behind religious extremism in many philosophically interesting ways. It is not at all promoting extremism, but the fact that motivations beyond the tired “religious = violent” rhetoric that too often plays out in commentary on terrorism are brought up adds even more solid worldview-level bites to chew on. The key issue is that quote-unquote “religious extremists” certainly themselves believe they are acting rationally, and to have the story play this out in a way in which multiple extremists are spoken to on a logical level rather than simply discounted was fantastic. Eternity Falls is an excellent cyberpunk tale with surprisingly strong philosophical and theological themes. I highly recommend you read it. It presents humanity as a complex of different influences, and God’s plan as a theme throughout the world. 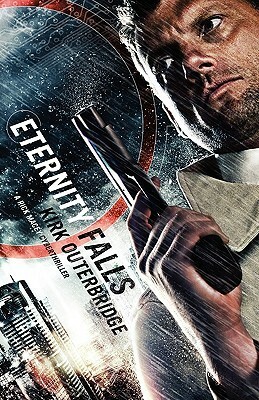 Microview: “Eternity Falls” by Kirk Outerbridge– I reviewed the book, including giving some “good” and “bad” points along with a letter grade. Check out the review! Kirk Outerbridge, Eternity Falls (Colorado Springs, CO: Enclave, 2009). When it comes to religion and violence, see William Cavanaugh’s The Myth of Religious Violence: Secular Ideology and the Roots of Modern Conflict. I’m a huge fan of that book. I discussed a central premise in one of my more read posts, and I also reviewed the book. Heh, I glanced at the comments and see you stirred up quite the hornet’s nest. It would appear that many of the commenters (well, comments) ignore the power that categories can have for shaping thought. Indeed, per Bent Flyvbjerg’s Rationality and Power: Democracy in Practice and James Davison Hunter’s To Change the World, power is precisely that ability to define reality. I tried to talk about “power to bless vs. power to control” with Dr. Hunter in person last November and he balked at such a dichotomy, insisting that with power you define reality. Do you know of other books which deal with bad categories which have corrupted good thinking about reality? I’m reminded of Hilary Putnam’s The Collapse of the Fact/Value Dichotomy and a few other books with which I won’t clutter this comment further.